So...that Skyrim game...that just goes on and on and on. I’ve been mainlining the Dawnbreaker DLC with the little time I’ve had for gaming. It is amazing how very little you can get accomplished in an hour-long session of Skyrim. The Dawnbreaker DLC is loads of fun and has interesting new areas to explore, but it really packs on the hours. Both expansions for Skyrim are each about 20 hours long for a “completionist” according to HowLongToBeat.com and, even if I lowball it to 20 hours for both (based on my pace and laissez-faire attitude towards completionism), that’s still more time for the Skyrim DLC than most other complete game experiences. It is hard not to notice the passage of great amounts of time when you are playing an Elder Scrolls game, particularly when you are standing for most of it in VR. I also played another lengthy session of Crackdown 3 online with my friend last week and, while it is still hard to deal with my crushed expectations, it is still somewhat mindlessly enjoyable in co-op (though extremely repetitive). The 30fps cap for online co-op still stings a lot, especially when I can see the game easily running at 60fps in the single player and the PVP multiplayer modes. I do appreciate the crossplay though, I’m playing on PC while my buddy is playing on Xbox One and we never seem to hit any snags. 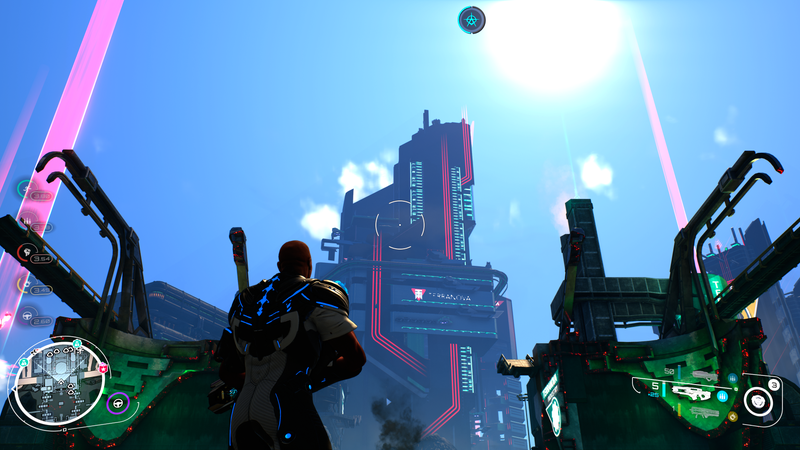 Crackdown 3 really feels like the first game all over again with some spit and polish (and even not so much of that). It doesn’t do anything particularly well or innovative, but it does have this jumpy-shooty aspect that is undeniably fun to control. However, you’d be much better off playing the superior Saints Row IV if you haven’t played either game. Saints Row IV took all the best parts of the original Crackdown and added better gameplay and hilarious writing. Crackdown 3 took the best parts of the first game and gave them to me again with terrible writing and the worst companion commentators (radio chatter) I’ve heard in years. I don’t see the giant leap in technology that I would expect from 5 years in developments and, while I understand the deep troubles that plagued Crackdown 3 during those developmental years...I still feel let down. Most of Microsoft’s recent first-party titles seem to be somewhat bare-boned at launch and Crackdown 3 is no exception. Microsoft does seem good about continued support for their games and titles like Sea Of Thieves have seen a lot of post-release support and content, so maybe there is hope for Crackdown 3 down the road. I don’t know what I was expecting with the gameplay, but I was at least expecting innovation not imitation. I used my Bing points to buy my Game Pass subscription (for whatever bargain I strike with Microsoft when I perform their quiz-tasks), so I can’t be too mad at Crackdown 3 on my pocketbook. Also, co-op video game campaigns are too few and far between to ignore, but this feels like yet another case of a Microsoft title that fails to live up to the hype. It’s a shame, I had such high hopes for this one. I’d like to get some time with Breath Of The Wild this weekend as well as putting some more miles on Skyrim VR. I’m toying with the idea of taking a break with another game before tackling the final DLC content (Dragonborn), but I’m afraid it would be hard to come back. Skyrim isn’t a game, it’s a lifestyle.